For those of you not fortunate enough to know my cousin Jenny, please allow me to introduce her. Her name is Jennifer Lynn McCumber Komp. Ah, I can see from the applause that most of you already know her. Well, we have alot of material to cover, so please hold your applause to the end. Thank you. Yes, we all have known great Jennifers in the world. Some of you may be familiar with a little known film actor of Greek descent...Jennifer Aniston. This Jennifer is pretty, talented, rich and very successful, but not quite the caliber of the Jennifer we are honoring today. Others may know about a singer/actress named Jennifer Lopez...ya know, Jenny from the Block. She too is quite lovely, but can't hold a candle to our Jennifer. So, just so you know...the best Jennifer of all, the best Jennifer in the history of all Jennifers is OUR VERY OWN! We get to have her in our very own family! HOW INCREDIBLY lucky are we!?!! Yes, there she is. In her element. 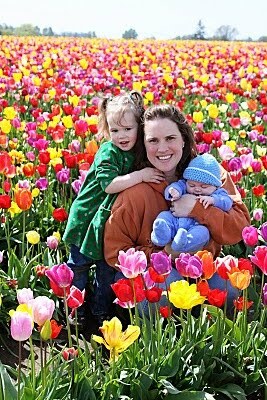 With her beautiful children, in a beautiful field of flowers. Beauty abounds!! Just look at her. Ok, so you're wondering why the superfluous post about our wonderful Jennifer? A) She deserves it. B) She introduced me to our friend...The Pioneer Woman. www.thepioneerwoman.com. It's only the greatest blog ever. And so, Jenny went down there, children and husband in tow and stood in line for like HOURS AND HOURS and then...and then....let me be there in SPIRIT by taking my picture. I was moved, touched, verkelmpt and all of those things!! Thank you so much. That was awesome! !